November brought a unusual amount of snow to the Almanor Basin. Usually November weather systems come in as rain, but those cold north winds made for some large amounts of snow instead, with temperatures dropping into the low teens at night. With below freezing temperatures coupled with high winds, most fishermen stayed in and waited for the breaks in the systems before launching. Canyon Dam has been plowed, and offers the only public launch access. Surface temperatures are at 39 degrees and there is five to six feet of visibility. Some ice is forming along the shaded coves and in the shallows near the Causeway, but the lake looks good and there has been zero fishing pressure. This time of year fish are still very active and are looking to feed, its time to bulk up for the leaner winter months ahead when food always seems to be more scarce. Dark cool water reminds fishermen to slow down there trolling speed this time of year, also the use of dodgers and flashers will help bring hungry fish over for a look, and the hook. These fish want meat! Threaded crawlers, are a good bet, but my last outing the crawlers froze solid, and we could not even use a worm threader. Sep’s scented grubs in chartreuse and orange, 14 inches behind an 04 silver prism dodger is good application, and they won’t freeze. A few boat are still trolling lures like, Needlefish in silver, or red and gold Speedy Shiners, and the increasingly popular, "Sep’s Pro Secret" also in red and gold, rigged, or lead core, down 6 feet early morning, and dropping down to 18 feet later when the sun gets high. All these lures and even nightcrawlers need an application of Pro-Cure "Trophy Trout" applied with a small basting brush. These combinations of lures with this scent will have you catching fish here. The Browns are in the full spawn cycle, hens need to be released, try not to net them if you get hooked up. Bank Fishermen are working the Hamilton Branch for rainbows by floating crawlers under bobbers, with good results. If you can get down the snow covered trail. Geritol Cove at Canyon Dam is good one day and off the next, hit it on the right day and its all good. Water levels are still very good, but are coming down watch for hazards. 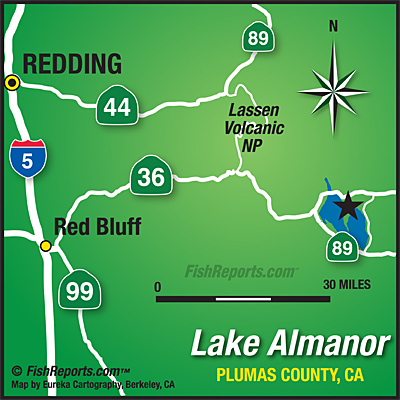 It’s a good time to fish Almanor, If your planning a trip here, just keep a eye on the weather, It will be changing again soon. Smaller boats not advised if wind is forecasted.